Ferrous metallurgy involves processes and alloys based on iron. It began far back in prehistory. The earliest surviving iron artifacts, from the 4th millennium BC in Egypt, were made from meteoritic iron-nickel. It is not known when or where the smelting of iron from ores began, but by the end of the 2nd millennium BC iron was being produced from iron ores from China to Africa south of the Sahara. The use of wrought iron (worked iron) was known by the 1st millennium BC. During the medieval period, means were found in Europe of producing wrought iron from cast iron (in this context known as pig iron) using finery forges. For all these processes, charcoal was required as fuel. Steel (with a carbon content between pig iron and wrought iron) was first produced in antiquity as an alloy. Its process of production, Wootz, was exported before the 4th century BC to ancient China, Africa, the Middle East and Europe. Archaeological evidence of cast iron appears in 5th century BC China. 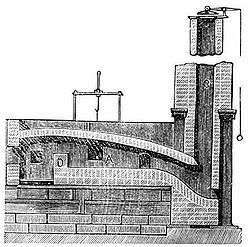 New methods of producing it by carburizing bars of iron in the cementation process were devised in the 17th century. During the Industrial Revolution, new methods of producing bar iron without charcoal were devised and these were later applied to produce steel. 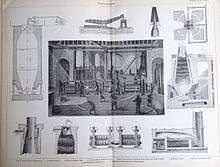 In the late 1850s, Henry Bessemer invented a new steelmaking process, that involved blowing air through molten pig iron to burn off carbon, and so to produce mild steel. This and other 19th-century and later processes have displaced the use of wrought iron. Today, wrought iron is no longer produced on a commercial scale. Meteoric iron was also fashioned into tools in the Arctic, about the year 1000, when the Thule people of Greenland began making harpoons, knives, ulos and other edged tools from pieces of the Cape York meteorite. Typically pea-size bits of metal were cold-hammered into disks and fitted to a bone handle. These artifacts were also used as trade goods with other Arctic peoples: tools made from the Cape York meteorite have been found in archaeological sites more than 1,000 miles (1,600 km) distant. 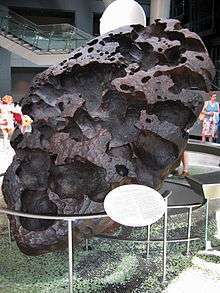 When the American polar explorer Robert Peary shipped the largest piece of the meteorite to the American Museum of Natural History in New York City in 1897, it still weighed over 33 tons. Another example of a late use of meteoritic iron is an adze from around 1000 AD found in Sweden. Iron smelting—the extraction of usable metal from oxidized iron ores—is more difficult than tin and copper smelting. While these metals and their alloys can be cold-worked or melted in relatively simple furnaces (such as the kilns used for pottery) and cast into molds, smelted iron requires hot-working and can be melted only in specially designed furnaces. Thus it is not surprising that humans mastered the technology of smelted iron only after several millennia of bronze metallurgy. The place and time for the discovery of iron smelting is not known, partly because of the difficulty of distinguishing metal extracted from nickel-containing ores from hot-worked meteoritic iron. The archaeological evidence seems to point to the Middle East area, during the Bronze Age in the 3rd millennium BC. However, iron artifacts remained a rarity until the 12th century BC. The Iron Age is conventionally defined by the widespread replacement of bronze weapons and tools with those of steel. That transition happened at different times in different places, as the technology spread. Mesopotamia was fully into the Iron Age by 900 BC. Although Egypt produced iron artifacts, bronze remained dominant until its conquest by Assyria in 663 BC. The Iron Age began in Central Europe about 500 BC, and in India and China between 1200 and 500 BC. Around 500 BC, the Nubians who had learned from the Assyrians the use of iron and were expelled from Egypt, became major manufacturers and exporters of iron. 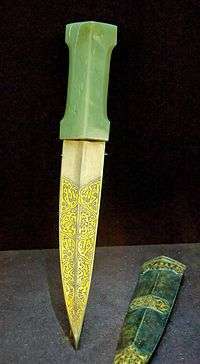 One of the earliest smelted iron artifacts, a dagger with an iron blade found in a Hattic tomb in Anatolia, dated from 2500 BC. About 1500 BC, increasing numbers of non-meteoritic, smelted iron objects appeared in Mesopotamia, Anatolia, and Egypt. Nineteen iron objects were found in the tomb of Egyptian ruler Tutankhamun, died in 1323 BC, including an iron dagger with a golden hilt, an Eye of Horus, the mummy's head-stand and sixteen models of an artisan's tools. An Ancient Egyptian sword bearing the name of pharaoh Merneptah as well as a battle axe with an iron blade and gold-decorated bronze shaft were both found in the excavation of Ugarit. Although iron objects dating from the Bronze Age have been found across the Eastern Mediterranean, bronzework appears to have greatly predominated during this period. By the 12th century BC, iron smelting and forging, of weapons and tools, was common from Sub-Saharan Africa through India. As the technology spread, iron came to replace bronze as the dominant metal used for tools and weapons across the Eastern Mediterranean (the Levant, Cyprus, Greece, Crete, Anatolia, and Egypt). The history of metallurgy in the Indian subcontinent began in the 2nd millennium BC. Archaeological sites in Gangetic plains have yielded iron implements dated between 1800 – 1200 BC. 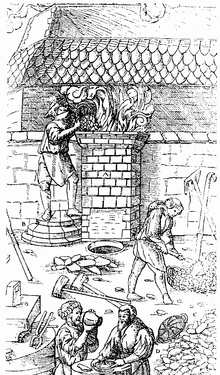 By the early 13th century BC, iron smelting was practiced on a large scale in India. In Southern India (present day Mysore) iron was in use 12th to 11th centuries BC. The technology of iron metallurgy advanced in the politically stable Maurya period. and during a period of peaceful settlements in the 1st millennium BC. Iron artifacts such as spikes, knives, daggers, arrow-heads, bowls, spoons, saucepans, axes, chisels, tongs, door fittings etc., dated from 600 to 200 BC, have been discovered at several archaeological sites of India. The Greek historian Herodotus wrote the first western account of the use of iron in India. The Indian mythological texts, the Upanishads, have mentions of weaving, pottery, and metallurgy as well. The Romans had high regard for the excellence of steel from India in the time of the Gupta Empire. Perhaps as early as 500 BC, although certainly by 200 AD, high quality steel was produced in southern India by the crucible technique. In this system, high-purity wrought iron, charcoal, and glass were mixed in a crucible and heated until the iron melted and absorbed the carbon. Iron chain was used in Indian suspension bridges as early as the 4th century. Historians debate whether bloomery-based ironworking ever spread to China from the Middle East. 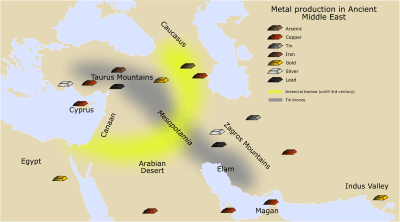 One theory suggests that metallurgy was introduced through Central Asia. The earliest cast iron artifacts, dating to 5th century BC, were discovered by archaeologists in what is now modern Luhe County, Jiangsu in China. Cast iron was used in ancient China for warfare, agriculture, and architecture. Around 500 BC, metalworkers in the southern state of Wu achieved a temperature of 1130 °C. At this temperature, iron combines with 4.3% carbon and melts. The liquid iron can be cast into molds, a method far less laborious than individually forging each piece of iron from a bloom. During the Han Dynasty (202 BC–220 AD), the government established ironworking as a state monopoly (repealed during the latter half of the dynasty and returned to private entrepreneurship) and built a series of large blast furnaces in Henan province, each capable of producing several tons of iron per day. By this time, Chinese metallurgists had discovered how to fine molten pig iron, stirring it in the open air until it lost its carbon and could be hammered (wrought). (In modern Mandarin-Chinese, this process is now called chao, literally, stir frying.) By the 1st century BC, Chinese metallurgists had found that wrought iron and cast iron could be melted together to yield an alloy of intermediate carbon content, that is, steel. According to legend, the sword of Liu Bang, the first Han emperor, was made in this fashion. Some texts of the era mention "harmonizing the hard and the soft" in the context of ironworking; the phrase may refer to this process. The ancient city of Wan (Nanyang) from the Han period forward was a major center of the iron and steel industry. Along with their original methods of forging steel, the Chinese had also adopted the production methods of creating Wootz steel, an idea imported from India to China by the 5th century AD. During Han Dynasty, the Chinese were also the first to apply hydraulic power (i.e. a waterwheel) in working the bellows of the blast furnace. This was recorded in the year 31 AD, as an innovation of the engineer Du Shi, Prefect of Nanyang. Although Du Shi was the first to apply water power to bellows in metallurgy, the first drawn and printed illustration of its operation with water power appeared in 1313 AD, in the Yuan Dynasty era text called the Nong Shu. In the 11th century, there is evidence of the production of steel in Song China using two techniques: a "berganesque" method that produced inferior, heterogeneous steel and a precursor to the modern Bessemer process that utilized partial decarbonization via repeated forging under a cold blast. By the 11th century, there was a large amount of deforestation in China due to the iron industry's demands for charcoal. By this time however, the Chinese had learned to use bituminous coke to replace charcoal, and with this switch in resources many acres of prime timberland in China were spared. The change of fuel resources from charcoal to coal was pioneered in Roman Britain by the 2nd century AD, although it was also practiced in the Germanic Rhineland at the time. In the regions of Tanzania inhabited by the Haya people, carbon dating has shown that blast furnaces were as old as 2000 years, whereas steel of this calibre did not appear in Europe until several centuries later. Cast iron development lagged in Europe, as the smelters could only achieve temperatures of about 1000 C; or perhaps they did not want hotter temperatures, as they were seeking to produce blooms as a precursor of wrought iron, not cast iron. Through a good portion of the Middle Ages, in Western Europe, iron was still being made by the working of iron blooms into wrought iron. Some of the earliest casting of iron in Europe occurred in Sweden, in two sites, Lapphyttan and Vinarhyttan, between 1150 and 1350. Some scholars have speculated the practice followed the Mongols across Russia to these sites, but there is no clear proof of this hypothesis, and it would certainly not explain the pre-Mongol datings of many of these iron-production centres. In any event, by the late 14th century, a market for cast iron goods began to form, as a demand developed for cast iron cannonballs. In the early 17th century, ironworkers in Western Europe had developed the cementation process for carburizing wrought iron. Wrought iron bars and charcoal were packed into stone boxes, then held at a red heat for up to a week. During this time, carbon diffused into the iron, producing cement steel or blister steel. One of the earliest places where this was used in England was at Coalbrookdale, where Sir Basil Brooke had two cementation furnaces (recently excavated). For a time in the 1610s, he owned a patent on the process, but had to surrender this in 1619. He probably used Forest of Dean iron as his raw material, but it was soon found that oregrounds iron was more suitable. The quality of the steel could be improved by faggoting, producing the so-called shear steel. ↑ Rehren, T; et al. (2013). "5,000 years old Egyptian iron beads made from hammered meteoritic iron". Journal of Archaeological Science. 40: 4785–4792. doi:10.1016/j.jas.2013.06.002. 1 2 3 4 5 6 7 Photos, E. (1989). "The Question of Meteoritic versus Smelted Nickel-Rich Iron: Archaeological Evidence and Experimental Results". World Archaeology. 20 (3): 403–421. doi:10.1080/00438243.1989.9980081. JSTOR 124562. 1 2 3 4 Miller, Duncan E.; Der Merwe, N.J. Van (1994). "Early Metal Working in Sub-Saharan Africa: A Review of Recent Research". Journal of African History. 35: 1–36. doi:10.1017/s0021853700025949. 1 2 3 4 Stuiver, Minze; Der Merwe, N.J. Van (1968). 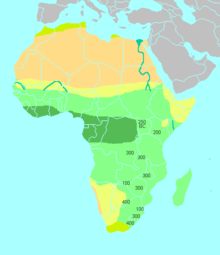 "Radiocarbon Chronology of the Iron Age in Sub-Saharan Africa". Current Anthropology. 9: 54–58. doi:10.1086/200878. 1 2 Donald B. Wagner (1993). 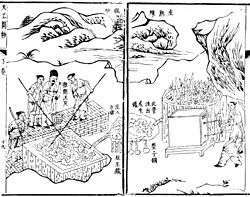 Iron and Steel in Ancient China. BRILL. pp. 335–340. ISBN 978-90-04-09632-5. 1 2 Waldbaum, Jane C. From Bronze to Iron. Göteburg: Paul Astöms Förlag (1978): 56–58. 1 2 Richard Cowen () The Age of Iron Chapter 5 in a series of essays on Geology, History, and People prepares for a course of the University of California at Davis. Online version accessed on 2010-02-11. 1 2 Waldbaum 1978: 23. 1 2 3 Muhly, James D. 'Metalworking/Mining in the Levant' pp. 174-183 in Near Eastern Archaeology ed. Suzanne Richard (2003), pp. 179-180. 1 2 Tewari, Rakesh (2003). "The origins of iron-working in India: new evidence from the Central Ganga Plain and the Eastern Vindhyas" (PDF). Antiquity. 77 (297): 536–544. doi:10.1017/s0003598x00092590. 1 2 3 G. Juleff (1996). "An ancient wind powered iron smelting technology in Sri Lanka". Nature. 379 (3): 60–63. Bibcode:1996Natur.379...60J. doi:10.1038/379060a0. ↑ Juleff, G. (1996). "An ancient wind powered iron smelting technology in Sri Lanka". Nature. 379 (3): 60–63. Bibcode:1996Natur.379...60J. doi:10.1038/379060a0. ↑ R. Balasubramaniam (2002), Delhi Iron Pillar: New Insights. Aryan Books International, Delhi ISBN 81-7305-223-9. ↑ Hartwell, Robert (1966). "Markets, Technology and the Structure of Enterprise in the Development of the Eleventh Century Chinese Iron and Steel Industry". Journal of Economic History. 26: 53–54. ↑ Smith, A. H. V. (1997). "Provenance of Coals from Roman Sites in England and Wales". Britannia. 28: 297–324 (322–324). doi:10.2307/526770. ↑ R. L. Miller (October 1988). "Ahmad Y. Al-Hassan and Donald R. Hill, Islamic technology: an illustrated history". Medical History. 32 (4): 466–7. doi:10.1017/s0025727300048602. 1 2 Adam Lucas (2006), Wind, Water, Work: Ancient and Medieval Milling Technology, p. 65. BRILL, ISBN 90-04-14649-0. ↑ Kochmann, W.; Reibold M.; Goldberg R.; Hauffe W.; Levin A. A.; Meyer D. C.; Stephan T.; Müller H.; Belger A.; Paufler P. (2004). "Nanowires in ancient Damascus steel". Journal of Alloys and Compounds. 372: L15–L19. doi:10.1016/j.jallcom.2003.10.005. ISSN 0925-8388. Levin, A. A.; Meyer D. C.; Reibold M.; Kochmann W.; Pätzke N.; Paufler P. (2005). "Microstructure of a genuine Damascus sabre" (PDF). Crystal Research and Technology. 40 (9): 905–916. doi:10.1002/crat.200410456. ↑ Reibold, M.; Levin A. A.; Kochmann W.; Pätzke N.; Meyer D. C. (16 November 2006). "Materials:Carbon nanotubes in an ancient Damascus sabre". Nature. 444 (7117): 286. Bibcode:2006Natur.444..286R. doi:10.1038/444286a. PMID 17108950. ↑ Lucas, A. R. (2005). 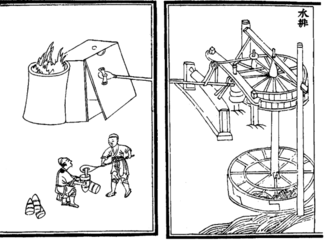 "Industrial milling in the ancient and Medieval Worlds". Technology and Culture. 46: 19. doi:10.1353/tech.2005.0026. ↑ King, P. W. (2002). "Dud Dudley's contribution to metallurgy". Historical Metallurgy. 36 (1): 43–53. ↑ King, P. W. (2001). "Sir Clement Clerke and the adoption of coal in metallurgy". Trans. Newcomen Soc. 73 (1): 33–52. doi:10.1179/tns.2001.002.